Posted on November 19, 2018 by Julia Marnadi. This entry was posted in Eating Well, Staying Healthy and tagged eating well, nutrition, rd blog, Staying Healthy. Bookmark the permalink. Fall is my favorite season of the year—a chance to take in the beautiful colors all around—not only in trees, but also through vibrant vegetables and fruits that abound during the harvest season. Apples, carrots, sweet potatoes, yams, winter squash, cranberries, radishes, grapes, and bell peppers are only a few of many options! I love to experiment cooking with different varieties of squash this time of year. Not only are these fruits and vegetables beautifully colored and intricately shaped, there are also a host of reasons why it is good for us to eat them! Vitamin A: Squash is a rich source of alpha-carotene and beta-carotene which is readily converted into Vitamin A. This nutrient plays an important role in immune function and eye health. Fiber: Squash is good source of soluble fiber (fiber that dissolves in water). Its high viscosity helps slow the rate at which digested food leaves your stomach, a quality that contributes to long-term satiety. Hubbard and acorn squash are particularly high in fiber. One cup of baked Hubbard squash supplies about 100 calories and 10 grams of fiber. Vitamin C: Squash is a good source of vitamin C, which plays a role in immune health; helping to repair and regenerate tissues, and playing a preventive role against heart disease. Anti-inflammatory: Squash contains anti-inflammatory compounds which help to neutralize the free radicals which play a role in illness, pre-mature aging, and heart disease. B-Complex vitamins: Butternut squash is rich in the B-complex group of vitamins like folate, riboflavin, niacin, vitamin B-6 (pyridoxine), thiamin, and pantothenic acid.- B vitamins contribute to efficient and fully functioning metabolism of macronutriens (fat, carbs, protein), as well as helping to fight infection and disease. Folic acid plays an important role in a healthy pregnancy and reduces the risk of serious birth defects. Protein: The seeds in the squash can be dried and roasted. They not only provide as a tasty snack but also a good source of plant protein, plant-based omega 3 fatty acid, zinc and magnesium. 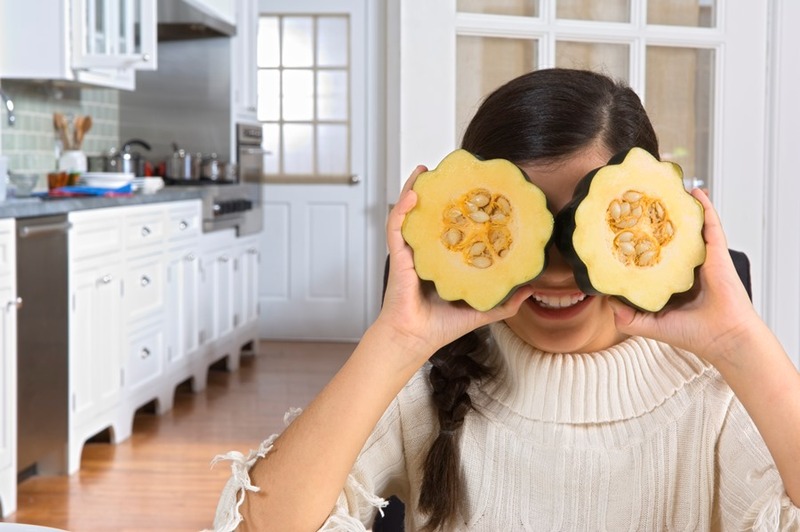 Squash is incredibly versatile and can substituted for mashed potatoes, used for making great-tasting soups, or can be a healthy addition to baked goods, such as cookies, cakes, and pies! Kabocha squash: This squash is hard and green on the outside; the flesh inside is vibrant orange in color—which speaks for its own benefits. Kabocha squash can be stored for 1-2 months in a cool place with good air circulation. Finely chop the onion and crush the garlic. Heat oil in a large, heavy-bottomed saucepan. Add the onion; sauté over low heat until soft, then add the crushed garlic and stir for another minute. Add squash and red pepper to the pan, stir. Add curry powder and garam masala and stir until coated. Pour hot stock to cover vegetables; bring to boil, then reduce heat to a simmer. Cook for 20 minutes, or until the squash has softened. While the curry is cooking, rinse the rice and cook according to the package instructions. Remove skin from the salmon fillets; cut into small bite sized pieces with scissors. Add salmon, coconut milk and peas to pan; cook through until the salmon is flaky and the vegetables are tender. Heat oil in pan. Sauté chilies, pepper, peanuts and coconut until lightly toasted. Grind into a paste. Set aside. Place cubed pumpkin in small pot; cover with small amount of water. Add salt and turmeric to taste. Simmer until tender. Blanch tomatoes; cool slightly and puree. Cook Toor dal in pressure cooker according to directions. If using lentils, simmer in water until slightly firm, but tender. Heat 1-2 tsp oil in skillet; add mustard seeds. When they start to pop, add onion, ginger and curry leaves; sauté until onion is transparent. Add cooked pumpkin, ground paste, tomato puree, cooked dal, and salt; mix well and cook over low flame until everything is combined. Julia Marnadi, RD, CD is an inpatient dietitian for hematology oncology and bone marrow transplant population at UWMC. In her spare time, she likes cooking, spending time with her family, and running with her friends.